The ONLY shower curtain you'll ever need! Hey everybody... we got a new shower curtain liner yesterday! IT'S A PLASTIC SHOWER CURTAIN PEOPLE... NOT FIREWORKS! Apparently the marketing guy's job was at risk and he needed a breakthrough design to save his career. I sure hope this did it for him. At first glance you might think there's nothing all that unusual about this package, but I've taken the liberty of over-analyzing it for your pleasure. Let's take a look at some of the details, shall we? Ding ding ding... AND IN THIS CORNER... WE HAVE THE HEAVY WEIGHT VINYL SHOWER CURTAIN/LINER CHAMPION OF THE WORLD! Good idea! Much better than those stupid tissue paper shower curtain liners the other people sell. Not just 1 or 2... No, this product has 8 suction cups to keep it tight against your shower wall! Simply wet the portion of the wall you want the liner to suction to*, find the 1/4" suction cups somewhere along the side of the material, and be amazed as your curtain miraculously adheres to your shower wall for a full 3 or 4 seconds! Wha-huh? Is this really a problem... shower curtains bursting into flames in your bathroom? Perhaps this is important for the people who smoke while they're showering. In 10 years I walk up to the Target customer service agent with a rotten, moldy shower curtain and plop it on the counter. My friendly cashier takes one look at it, smiles at me and says, "Oh, you say this has a lifetime guarantee? Well then, here's your money back sir." Oh, for crying out loud! I'd hate to see what they'd say about shower curtain hooks. They get an A for effort, though. They should make car bodies out of that stuff. kathy - Yeah, I wonder what you'd use to put out a shower curtain? The SHOWER perhaps? rick - Good idea. Plus it would mildew resistant for life! Smoking in the shower! Never even thought of trying that. Hmmm. Target is known for some pretty good customer service, but you might want to hold on to that packaging, as proof, just in case. What grabbed your attention at the store? Was it the bright colored star looking thingy? Down here, all we get are very simple packages that have nothing on them. Can you say b-o-r-i-n-g? So did it have that fresh liner smell, that always seems to nauseate you when you open tha packaging? THAT would be a plus, in my book. Hey don't laugh, my new job is marketing, I've printed off this post to help me write our next big software launch next month. I think suction cups would be a great incentive with payroll software. Why didn't you tell me sooner???? And all these years I was using a bed sheet as a shower curtain. WHere was this amaze-o-curtain ten years ago? Damn, I bet I could build a tornado shelter out of that thing. 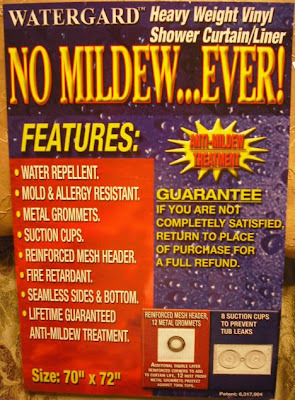 what I wanna know is....is it really mildew resistant. I'll check back in a few years. That's so funny. But now I have shower curtain envy! I, too, was stuck on the fire retardant claim. But ummm I have to ask. How much extra did you pay for all this glory? Ohhh! And my validation word is ptorch. I love it. "Okay guys, we really need a good marketing plan for this new product." "Yeah? Let's get Phil. He's the best. Always knows just what to put on the package." "Hey Phil! What angle should we take with this here shower curtain?" "Shower curtain eh? You know, I bet this baby is water repellant." "It IS? Whoa. We should definitely highlight that." "I told you Phil was a genius." sandy - Exactly. That one sounds like something I would have put on there as a joke just to see if I could get away with it. roger - Yes... it DOES smell like freshly-opened vinyl poison around here now. WTH? jerrychicken - Funny. I think you could apply those to everything... "Now with suction cups!" maureen - I highly doubt they would have let you across the border with one of these because there is a top secret ingredient in them that makes them water resistant AND fire proof. Highly classified government stuff you know. sornie - Bed sheet huh? I'd hate to see what you sleep on! mom thumb - Darn right. Plus, you'd never get mildew if you lived in it for several months. windyridge - Apparently not. Remember that I had to return mine to Target in 10 years because it was moldy? Pay attention! babs - Good point. These people thought of everything! elizabeth - Aw, don't hate me because my curtain is beautiful. michelle - Technically I didn't buy it, my wife did. So I have no idea how much she paid for it. But you make an excellent point. HONEY!!! heather - That Phil... he's going places! The Final Daze Rest Home is interested in your inexpensive shower curtains. They think the water repellent aspect would make them an ideal replacemnt for the expensive rubber sheets they now use. Also being fire retardant is a plus over the rubber sheets currently in use. They do ask how many lifetimes in the guarantee? No wonder my bathroom's such a mess. I've never been lucky enough to find an amazing water-repellant shower curtain. Maybe now my cigarette will actually stay lit. I don't want to go anywhere where mold and mildew might be prominent, so this sounds like curtain for me. And for all those people that smoke in the shower, whats next? A smoke detector? LOL ... well, the suction cups things are a good idea. Not sure they're worthy of all this hype tho. I agree about the fire retardant. I mean ... it's in a shower. Water. Water is fairly fire retardant in itself. Anyway - I only ever use a see-thru shower curtain. So I can see the murders. I saw Psycho when I was young and it scared me ... emotionally. Not the murders. There aren't a lot of murders going on in my bathroom when I shower. I meant "murderers" ... the oncoming murderers. Which is of course much more sensible then what I previously typed. bill - That's a good point. A "lifetime" is a relative term! jd - Yes, be very suspicious of shower curtains that don't say they're water repellent. For example the one I bought recently made out of bread. Not a good plan. carlae - First they'd have to invent smoke detectors that weren't triggered by steam. We had a problem with that once. drowsey - I snorted when I read "So I can see the murders." I knew it was a typo right away but it cracked me up just thinking about you watching the murders from your shower. Wait... that shouldn't be funny at all. Little late chiming in but I paid an extra $11 for this shower curtain or 200% more than the cheapest one so the advertising TOTALLY worked on me!!!! charli - And I'm so glad you did. I haven't caught on fire since you got it! ve - You may even be able to "borrow" their technology. First shower radios, now cigarettes. What's next, shower meals? Brussel Sprouts -- now with suction cups! Chicken Soup -- now with suction cups! Spandex Body Glove -- now with suction cups! You're right, it really does make things better! The bad news is that shower curtain, like many things these days, is two inches shorter then the standard 72 inches. That's the sacrifice you make I guess for the reduced chance of catching on fire while showering.